Today I thought it’s time to install digikam and play with it. I was using digikam when I was still on Ubuntu and compared to F-Spot and Shotwell, digikam was way way superior when it comes to tag management. and installed diigkam 2.6.0 along with its necessary dependencies. Normally I don’t pay attention to the messages in the terminal after starting a program (Hello, Iceweasel), but digikam was nice enough to crash, so that I would not distract me from the error message. How kind. That does not sound too bad, so I accept it. Here you can see the capabilities of your browser and if you currently are in the HTML5 trial (which means HTML5 will be enabled). As you can see here, it states “You are not currently in the HTML5 trial”. That’s it. You don’t need to do anything else. 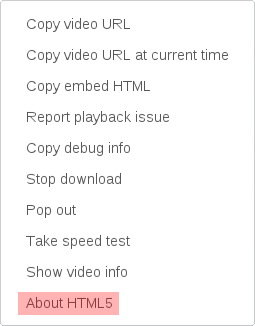 But one thing you should know is that the HTML5 based player will not work on all videos. Therefore, if you still happen to see the flash based video player on a lot of videos, it does not mean that enabling HTML5 did not work. It just means that those videos can not be presented to you using the HTML5 based player. The “About HTML5″ indicates that this is the HTML5 based player. 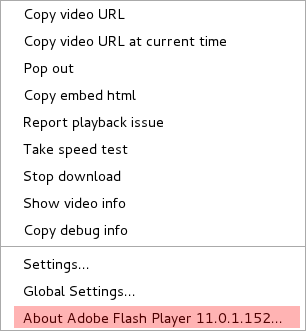 Like I said, the HTML5 based player will not be used for every video and you might even be wondering if entering the HTML5 trial worked at all, because quite a lot of videos will still be played with the Flash based player. All I can tell you is: It does work! The number of videos that will be presented to you this way will probably increase over time. where <n> stands for the number of the console you want to access (like Ctrl+Alt+F1 to get a text console and Ctrl+Alt+F7 to get back to your X session).